If you love being outdoors, then it only makes sense that you are going to have some of the best toys to make sure that your time is well spent. And if you are pulling a big toy hauler behind your rig, then you’ll have plenty of space for you to bring along all of your favorite toys. Here is a look at some of the most popular outdoor rides for your toy hauler, so you can load up and ship out for an unforgettably fun vacation. Heading to the lake this weekend? If so, don’t plan to go without your jet ski loaded in the toy hauler. 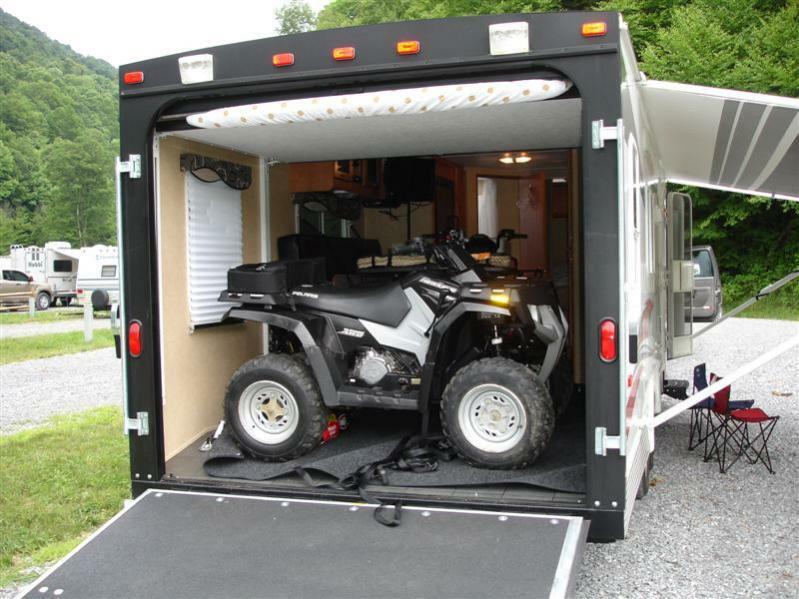 In a larger hauler, you can likely fit multiple Jet Ski units. So whether you are going to the lake by yourself or with the whole family, you’ll be able to load up the jets skis to hit the waves when you get there. Maybe the water isn’t your thing and instead you prefer to stay on land. If so, then the perfect toy for your hauler will be an ATV. Not only will ATVs show you the backwoods and unpaved roads like you’ve never seen, but they also make it incredibly easy for you to get over a variety of different terrains. When the snow starts falling, be sure to bring your snowmobile along for the ride. Your hauler may need to be outfitted specifically to deal with cold weather, so keep that in mind before you hit the road. But once you load up, get ready to hit the fresh powder on your snowmobile. Have a few 49cc motorbikes you want to bring along for the kids to enjoy? If so, you’ll have plenty of room for a couple of them in your toy hauler. Dirt bikes are great for the kids to enjoy during their time while on the road. You won’t be able to fit a luxury cruiser in the back of a toy hauler, but you may be able to get away with a smaller boat. Consider your dimensions carefully, as you might be better off getting an open toy hauler if you decide to bring a boat for the weekend. Like an ATV, a dune buggy lets riders explore previously untouched terrain. What many parents prefer about dune buggies, however, is that they are enclosed with roll cages. If you have younger riders that you prefer stay away from ATVs, load up your toy hauler with a dune buggy for everyone to enjoy. Not all of your toys have to be motorized. Throw a few mountain or road bikes into your hauler and you’ll be in for a great workout once you get to your destination. Another option for non-motorized toys include inflatable alternatives. From blow-up bounce houses to water trampolines, you can load up the toy hauler with a ton of inflatables. No matter what you like to do for fun, you’ll be doing it once you get to your destination if you have a toy hauler to bring along any of the fun options on this list. Crossroads Trailer Sales has been the #1 5th Wheel dealer in New Jersey for the last 8 years. Our 10 acre lot features over 250 5th wheels, travel trailers, and toy haulers to choose from. We are a family owned and operated business that has been proudly serving the RV community since 1988. Please contact us for all of your 5th wheel and trailer needs. We look forward to hearing from you and thanks for reading! 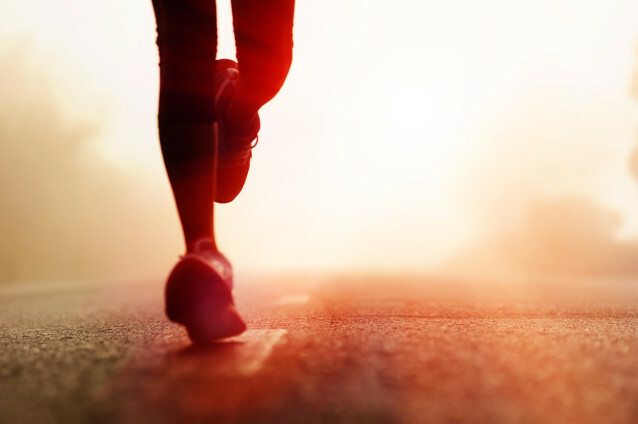 One of the toughest parts of traveling is making sure that you are stay fit and healthy. With so much else on your agenda, and so many delicious places to eat along the way, it’s nearly impossible to imagine fitting in an hour workout on top of it all. But if you are a super traveler who is on the road more often than not, then it’s imperative that you make consideration for your health and fitness. To help you stay as healthy as possible while on the road, here are some tips for how to stay fit during your travels. Your cushy fitness club may not be within walking distance, but that doesn’t mean that you can use the old excuse of, “I don’t have anywhere to train” while traveling. That’s because the world is your playground when it comes to fitness. If you have taken a family vacation in your motor home to the mountains, there’s nothing like a scenic run along inclined trails to get your blood flowing before anyone else wakes up. Or if you’ve decided to spend the night in a hotel, chances are there is an adequate weight room within their facility. There are a ton of different options for you to get in a workout, so your excuse had better not be that you don’t have any equipment. The world is your playground and staying active, no matter where you are, will help you stay fit during your travels. Whether it’s a quick 10-minute run or an hour-long yoga session, get in that fitness training whenever you can. That also can be said about the body parts you work, as you may have a set routine for training. But if Monday is typically your chest day and you think that you’ll be short on time this week, consider how a full body workout could be more useful. If you are willing to get in a workout at any point possible, you’ll have a much easier time staying fit while traveling. Another favor you can do for yourself includes watching what you eat. While on the road there are countless options, and it often seems easier to stop and grab something than it would be to cook. However, if you are taking your motor home on vacation, put that kitchen to good use and try to make more meals on your own. Or if you are still stuck on going out, consider getting a salad or light option instead of a double-stacked hamburger. The kids may love the idea of sleeping in for vacation, but use this time to keep the whole family healthy. By getting everyone involved, not only will the entire family get more out of their vacation, but you will all be living a healthier lifestyle together, too. Your vacation should be as stress free and relaxing as possible. But in-between all of the attractions and monuments, be sure to consider these tips for staying fit during your travels. For many, the perfect destination for their first adventure in their new motor home is Elkhart, Indiana. While the name may not ring loud like some others in America, Indiana is an iconic destination for motor home owners. That’s because it’s very likely that your motor home, fifth wheel, or RV was built in Elkhart. 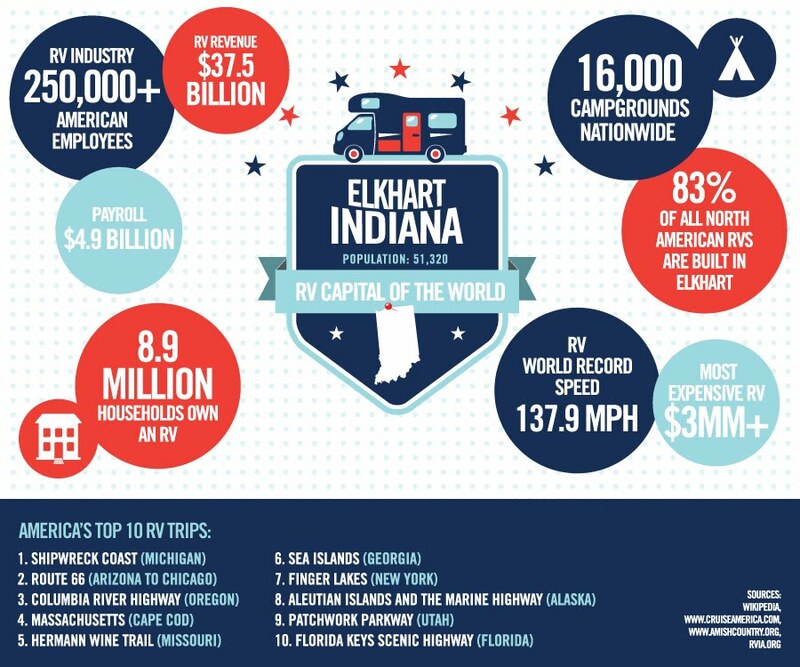 Known as the RV Capital of the World, here is a look at some of what Elkhart, Indiana has to offer. What started as an area mostly inhabited by Native American tribes, Elkhart saw much of its economic expansion in the late 1800’s. It’s likely that this is attributed to the infrastructure created by the Michigan Southern & Northern Indiana Railroad Company, which was the first major rail line through the area. Elkhart now has three major railroads, including two Amtrak rails, which make up for a good amount of traffic through the city. As it stands now, the population of Elkhart now sits at around 50,000, and much of the economy is stabilized by the creation of motor home units. Along with being known as the RV Capital Of The World, Elkhart is also known as the Band Instrument Capital of the World. If you played clarinet, flute, saxophone, or any other sort of instrument while growing up, chances are your instrument came from this community. With so many young musicians around the world, it’s great to take a stroll down memory lane by taking a road trip to Elkhart. As mentioned before, Elkhart is second to none when it comes to RV and motor home rig production. Forest River, Bennington Marine, Keystone, Skyline, Sun Valley, and Thor are just a few of the industry names that call Elkhart home. While you are in Elkhart, you’ll want to take part in plenty of other activities aside from just visiting an RV manufacturing plant. Luckily for you, there are plenty of those activities to take part in. The Elkhart Jazz Festival comes to town for three days during the summer, and it’s one of the premier festivals for jazz in the nation. The Elkhart Jazz Festival has been going strong for more than 25 years, and it remains a staple in the community every summer. Elkhart was also once home of the Elkhart Air Show. This annual event stopped in 2007 due to financial issues, but the community continues to keep it a part of its history. This air show brought in military, professional, and hobbyist aviation specialists for a performance that would light up the sky. Despite the fact that the air show has not been held for a few years, it’s presence can still be felt while visiting Elkhart, and it’d be great to see it resume again in the future. Elkhart, Indiana is known as the RV Capital of the World. That title, along with a multitude of other activities to take part in, make it an enjoyable destination to consider once you have your motor home. Looking for a new fifth wheel that is large enough to fit the whole family, but sleek enough to keep fuel costs down? If so, then you are going to love the 2016 Forest River Cedar Creek 36CKTS. Forest River continues to impress, as they’ve now introduced a new model into their line of rigs that already receive excellent reviews with the Cedar Creek. Here is a review of the 2016 Forest River Cedar Creek 36CKTS, a rig that is perfect for travelers of all types – no matter where your destination may be. We love the exterior of the Cedar Creek 36CKTS and we’ll feature that here shortly. However, taking a look inside will quickly show you just how beautiful of a unit this is. As you make your way to the back of the rig, you’ll find an oversized sleeping space that is perfect for two people. There are additional sleeping spaces in the form of another bed, as well as a pullout that comes from the couch. In all, you can comfortably fit a family of 8, or you could all get really close with one-another if you need to fit 10. No matter how many people you’re sleeping, you’ll be able to make sure that everyone has a fully belly throughout the day. The kitchen in the Cedar Creek 36CKTS is just another mark on the already impressive list of features. There is a large microwave and stovetop, making it easy for you to cook anything you need. Other key features inside include an oversized television for entertainment, a bathroom with enough room for two to get ready at once, as well as a rear backup camera for safety. The moment you step inside the Cedar Creek 36CKTS, you’ll finally understand the meaning of luxury in a fifth wheel. As beautiful as this 2016 Forest River model is on the inside, the outside is worthy of marveling over as well. The exterior paint is covered by a special protective layer, which means your rig will stay looking the way it did when you first got it for years to come. We also really like how easy it is to hook up this unit to your truck. Having to mess with a hitch can oftentimes be tedious, starting the entire adventure off on the wrong foot. But with how easy it is to set the Cedar Creek into the bed of your truck, you’ll be off and on the road in no time. Add in a sleek design that keeps the aerodynamics of your rig in mind, and you’ll also quickly appreciate the money you end up saving at the pump as well. At under $60k, this is a steal for this rig. Even if you plan on just taking out this unit only a few times a year, you’ll find the investment to be worth it. 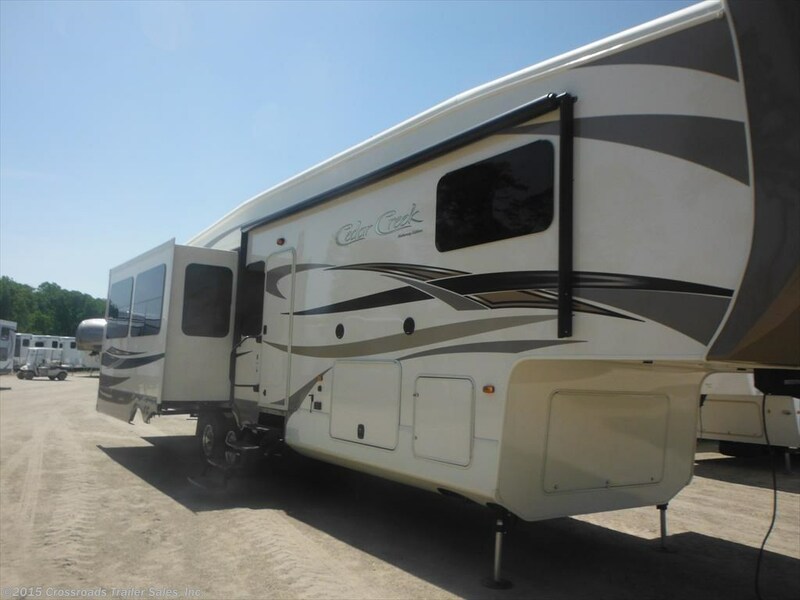 But when you quickly realize how much fun it is to travel in your own fifth wheel (especially one that is as superior as the Forest River Cedar Creek 36CKTS), you’ll likely end up taking it out so often that you’ll surely get your moneys worth over the lifetime you have this rig. There are a lot of fifth wheels to choose from. But with all that it offers, consider the 2016 Forest River Cedar Creek 36CKTS as one of the best options to choose from.